Reaching 100 years of age is remarkable enough. But the Navy made it extra special for a former Navy Seabee Dec. 2. Retired Capt. 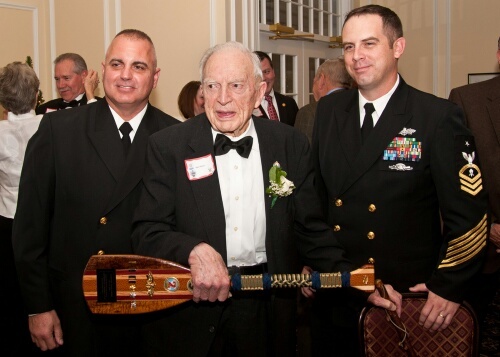 James R. Mims, the nation’s oldest living Seabee, was made an honorary member of Amphibious Construction Battalion 2 by the unit’s top sailor, Command Master Chief (SCW) Johnny DeSarro, during Mims’ 100th birthday party, held at the Oaks Country Club in Richmond, Va.. Mims also received a U.S. flag flown over the Capitol building, a birthday greeting from President Obama and a very cool commemorative paddle. Mims has experienced some remarkable moments in his life. 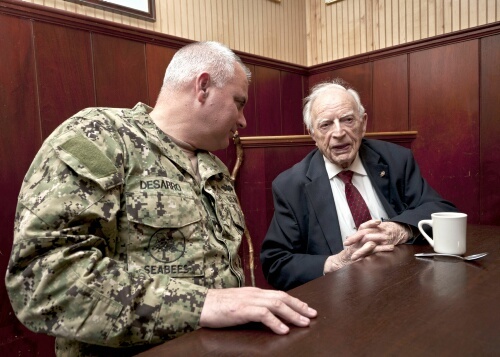 In DeSarro’s words, Mims “served at Okinawa during World War II, swore in the first 25 frogmen, known today as Navy SEALs, and met and spoke with Adm. Ben Moreell” — the father of the Seabees. DeSarro wanted to hear more about all that, so he returned to Richmond Dec. 19 to meet Mims at his hangout — a local restaurant called Joe’s Inn, where Mims goes every Friday for a meeting of the Bon Air Rotary Club — where he has a 56-year perfect attendance record. Naval Surface Force Atlantic released the Mims story on the day after the start of Bold Alligator, the largest Navy-Marine Corps amphibious exercise in a decade. The timing was splendid because Mims had some stories to tell about one of the biggest amphibious assaults in history. Mims was a Civil Engineer Corps cargo officer during that mission and his task that day was to rendezvous with the main Seabee camp, according to the story, by SURFLANT Mass Communication Specialist 3rd Class (SW/AW) Jonathan Pankau. “We rode on a (Landing Ship Tank) from Saipan to Okinawa in 1945 on an Easter Sunday morning,” Mims told Pankau. “There were 1,400 ships in that operation and we had some Marines in an Army DUKW (a six-wheel-drive amphibious truck used for transporting goods and troops over land and water and for use approaching and crossing beaches in amphibious attacks) heading for the east side of the island,” said Mims. Their mission was to trick the enemy by drawing fire to their location on the eastern coast of Okinawa and to delay Japanese reserve troops, according to Pankau. The main landing force assaulted the beach on the western coast that Easter Sunday, supported by the 2nd Marine Battalion’s effective decoy tactics. Exhaustion set in after two days of combat without sleep and Mims found an abandoned fox hole to take shelter in. As he looked up from his fox hole, a formation of Japanese fighter planes passed overhead. “I don’t know whether they were kamikazes or what but they flew so low I could see the first pilot’s face. I’ll never forget the smile on his face,” Mims told Pankau. Earlier, Mims had a brush with another seminal moment in naval history: The forming of the Navy SEALs. Today’s SEALs trace their lineage to a group of volunteers selected from the Seabees in the spring of 1943, according to Naval Special Warfare Command. Mims was the enlisting officer for the first 25 frogmen, according to the story. DeSarro said that making a Mims an honorary member of the unit was special. “We (Seabees) are fiercely proud of our heritage and we are very protective of anything that ties us to our history,” DeSarro said. “Making the paddle for him ties us back, in a big way, to our legacy and our heritage. I was so excited to find this site on the web. I lost my precious father, Ror R. Simmons, in April 2007. Growing up my Dad did not talk about his experiences in the war. What an honor to find out he participated in training for the invasion of Japan. He was in the Second engineer Special Brigade ASN 34 776 738, Company F, 542d Engineer Boat and Shore Regiment.